I didn't see Fifty Shades of Grey or Fifty Shades Darker. I don't have much of a desire to. My wife didn't read the books and I didn't read the books. My wife had no interest in seeing the movies and I certainly wasn't going into this one by myself and so whatever it is about this series that seems to capture supposedly off-limits sexual subjects and entice so many females will likely forever remain a mystery to me. All of this is to say this trilogy capper that completes the franchise that began in 2015 received a teaser trailer today as the promotional campaign has officially kicked off with a glimpse at the poster available as well after the jump. 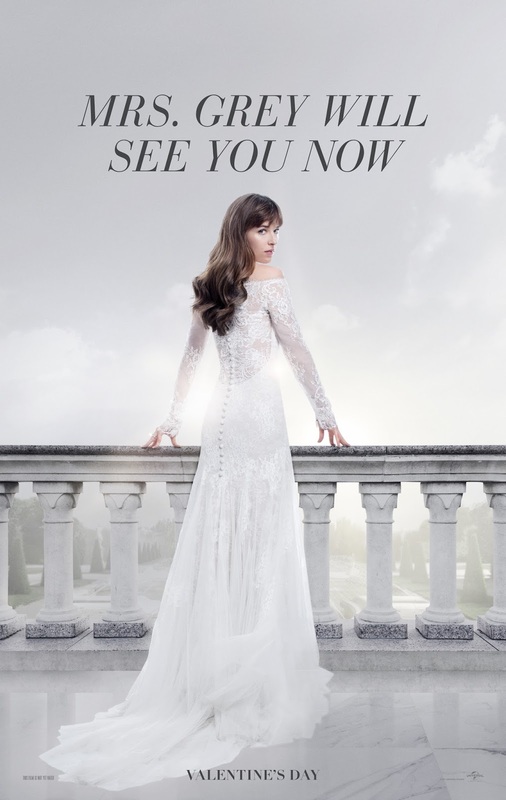 Fifty Shades Freed chronicles the continuing and presumed developing relationship between Christian Grey (Jamie Dornan) and Anastasia Steele (Dakota Johnson) as Anastasia must adjust not only to married life but to her new husband's wealthy lifestyle and controlling nature after accepting Christian's proposal in Fifty Shades Darker. While I admittedly don't know much about the story contained in the pages of E.L. James's best-selling series this first look at the sequel certainly seems to keep in step tonally with James Foley's follow-up to Sam-Taylor Johnson's first film. Foley is the sixty-three year old filmmaker who made Glengarry Glen Ross and At Close Range, but whose last feature film prior to this year's Darker was the out and out 2007 bomb Perfect Stranger that starred Bruce Willis and Halle Berry. Add to this the fact writer Niall Leonard, who had done strictly serialized television work prior to working on this series, took over for the more inexperienced Kelly Marcel and has adapted both the second and third novels for film and there might be some interesting layers to look for as the series progresses. Still, it is somewhat uninspiring as Fifty Shades Darker seemed to more or less get the same negative to downright terrible reviews that the first film received and so I don't really see the pace changing for this final installment even if that would seemingly suggest there is a lot more action to be had as the conclusion of all this comes to pass. Fifty Shades Freed also stars Victor Rasuk, Tyler Hoechlin, Arielle Kebbel, Eric Johnson, Max Martini, Dylan Neal, Rita Ora, Luke Grimes, Fay Masterson, Brant Daugherty, and opens on February 9th, 2018. Synopsis: Jamie Dornan and Dakota Johnson return as Christian Grey and Anastasia Steele in Fifty Shades Freed, the third chapter based on the worldwide bestselling “Fifty Shades” phenomenon. Expanding upon events set in motion in 2015 and 2017’s blockbuster films that grossed almost $950 million globally, the new installment arrives for Valentine’s Day 2018. Fifty Shades Freed is directed by Fifty Shades Darker’s James Foley (Fear, House of Cards) and once again produced by Michael De Luca, Dana Brunetti and Marcus Viscidi, alongside E L James, the creator of the culture-spanning blockbuster series. The screenplay is by Niall Leonard, based on the novel by James.